Today's the last day to sign up for this year's Holiday Ornament Exchange and Swap Hop. Tomorrow I'll be pairing everyone up and the real fun - getting to know our swap partners and creating ornaments will get under way. Want to sign up? Here's the link. Signups now closed for 2018. You can find more information about the Ornament Exchange in my earlier post, here. 2014 Ornament Exchange organized by Sally Russick. 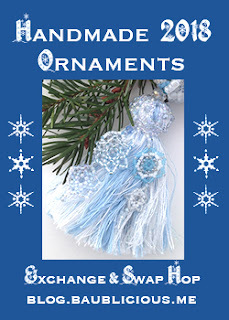 I'm afraid Sally's links no longer work, but almost all of the others lead directly to posts about the Ornament Exchange so you can see what was made. 2013 Ornament Exchange - also organized by Sally Russick. Her blog is still there, but I couldn't find the ornament post. Again, most of the rest of the links lead directly to the participant's 2013 ornaments.